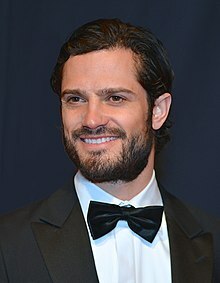 Prince Carl Philip of Sweden (Carl Philip Edmund Bertil, born May 13, 1979), Duke of Värmland is a Swedish prince. He is the second child of three children and only son of King Carl XVI Gustaf and Queen Silvia of Sweden. He was born Crown Prince of Sweden, because Sweden did not allow women to rule as Queen Regnant. On January 1, 1980 the Act of Succession was changed to introduce fully cognate succession. Since then, Carl Philip has been second in the line of succession, after his elder sister, Crown Princess Victoria. However, because the UK still has male primogeniture (brothers inherit before sisters), Carl Philip is ahead of his elder sister in the line of succession to the British throne. Carl Philip was christened at The Royal Palace Church on August 31, 1979. His godparents are Prince Bertil, Duke of Halland, Prince Leopold of Bavaria, Queen Margrethe II of Denmark, and Princess Birgitta of Sweden. He married Sofia Hellqvist on 13 June 2015. On 19 April 2016 their first child, Prince Alexander was born. This page was last changed on 25 April 2016, at 06:41.